(Nanowerk News) The inner space of carbon nanotubes can act as a template for the synthesis of nanodiamond-like carbon chains. As a team of scientists from Japan, Germany, and the United States report in the journal Angewandte Chemie ("Template Synthesis of Linear-Chain Nanodiamonds Inside Carbon Nanotubes from Bridgehead-Halogenated Diamantane Precursors"), this templated polymerization approach paves the way for the design of novel one-dimensional nanomaterials. Nanosized materials such as nanowires offer unique properties that are completely distinct from those of the bulk materials. 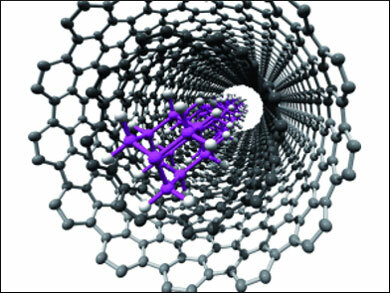 However, one-dimensional nanostructures are difficult to synthesize. In an international cooperation, Hisanori Shinohara from Nagoya University in Japan and his colleagues have developed a method that uses carbon nanotubes as a reaction vessel for the templated polymerization of linear-chain nanomaterials. The idea was that during polymerization, the small precursor molecules would naturally adopt the one-dimensional structure of the tubes only if their inner diameter is small enough. Larger diameters would offer too much space so that the polymerization could terminate or become uncontrolled. By using this method, Shinohara and his colleagues were able to synthesize a one-dimensional nanodiamond polymeric structure by a relatively simple annealing technique. They describe their approach: "The present template-based approach for the synthesis of linear-chain diamondoid polymers is entirely different from conventional chemical approaches." The scientists used diamantane, a 10-carbon cage structure, as a precursor molecule and building block for polymerization. This molecule was brominated at either side so that, upon addition of iron nanoparticles, the bromine would be abstracted and a diradical formed. In a normal chemical polymerization reaction, the formed radicals would abstract hydrogen for termination reactions, but: "To our great surprise, the radicals are persistent and recombined with each other inside the carbon nanotubes," the authors write. And: "Depending on the inner diameter of the carbon nanotubes, the inserted species can either be transformed into the linear-chain polymers or into amorphous carbon." As a result, the structures formed in the 1 nm-sized tubes were a polymeric chain of nanodiamondoids, which could be visualized impressively by electron microscopy. To put it more colloquially, the formed carbon nanotubes filled with the nanodiamondoid polymer look like macaroni filled with spaghetti. In order to extract the inner polymer, a solution-phase sonication/extraction can be applied, the group reports. The big advantage of the new method is the simplicity and specificity of the formation of the one-dimensional nanostructured polymer chain. This technique will certainly attract the attention of materials scientists.